The BCA 2019 Spring Meeting will take place at the University of Nottingham. You will find the conference venues well-signposted around the campus. Please click here to view a map of the campus. Please click here for further information about reaching the campus. There are a number of bus services running from Nottingham to Jubilee campus. There are buses from the city centre approximately every 10 minutes during the day, and it takes around 20 minutes to reach the campus. 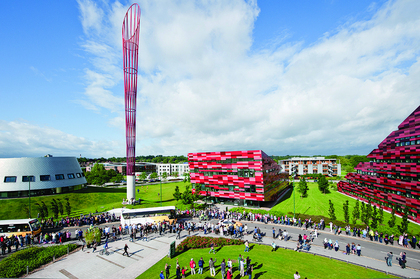 Buses L12, 31 Unilink and St Peter’s Court Shuttle go directly through the Jubilee campus. Buses leave from the bus stops on campus as well as on the main road at the campus entrance to take you back to the city centre. There are taxi ranks throughout the city and immediately adjacent to the main railway and bus stations. The journey to the campus takes approximately 15 minutes. From the East Midlands airport, taxis can be found on the terminal forecourt. The cost of a single/one way journey to the campus is approximately £40. Driving and Parking: For the purposes of route planners and sat-navs, the postcode to Jubilee Campus is NG8 1BB. As a residential delegate, car parking is included in your registration package, and you should request a permit on checking into your room at Newark Hall. If you are a day delegate, then please park in the Orange Parking zones, and request a parking permit at the conference registration desk in Business School South. NatWest Bank ATM Off the Jubilee Campus, there is a Co-Operative shop (Open until 22:00) on the main roundabout, green grocers, bakery, chemist, and a newsagent/Post Office. There is complimentary Wi-Fi for all delegates on Jubilee Campus. A link of how you can access this is available here:http://www.nottingham.ac.uk/it-services/services/wireless/uonguest.aspx. You will need to set up an account for internet access; we would advise that you set this up before you arrive for the conference as it will be valid for 7 days. Accommodation for the Spring Meeting is located at the University of Nottingham Jubilee campus, in Newark Hall. Bedrooms are all en-suite single occupancy accommodation with a shower, WC and wash basin. Check-in is from 15:00 on day of arrival, and check-out is until 10:00 on day of departure. There is a luggage store at Newark Hall if you need to store your luggage on the day of your arrival or departure. Please note that all bedrooms are no smoking areas. Newark Hall has 24-hour access. Upon checking in you will be given a swipe card which will allow you access to the hall of residence at all times. The main doors will lock at midnight but access can still be gained after this time by using the swipe card. Any guests who have not checked in by midnight are asked to use the free-phone at the entrance to the hall to call for security, who will let them into the hall of residence and give them their keys. There will be a member of the hall team available from 8.00am until midnight.